Hey guys! Today I'm going to show you my 2 Kleancolor Chunky Holo polishes. Don't let the names of these polishes fool you - they are not holo by any means! They're actually a duo-chromatic glitter in a slightly tinted base. I think Kleancolor caught on to the holo craze and decided to name their polishes this way to get more attention/sales! 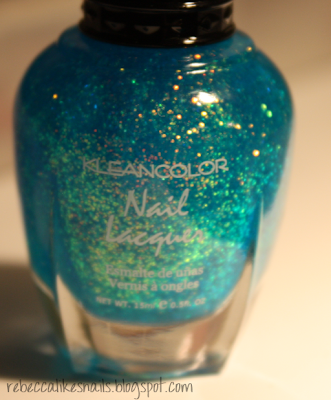 I took bottle pictures in two lighting conditions to show the prettiness in the bottle. You might be looking at the bottles and thinking "Wow, so many colors!" They're very very sheer and it wouldn't be attractive wearing them alone. A bit of advice I can give about these polishes since trying them is that you do NOT need more than one. Regardless that they all have a slightly tinted base, they look the same once you layer them. As you can see, they're identical over black. And over most other colors (besides really light ones) the tinted base is not going to make a noticeable difference. Now here they are over other polishes! It's best to use them over dark polishes to let the glitter show up more. This is Chunky Holo Teal over OPI - Ski Teal We Drop. It's pretty, but it's not totally my thing. Things that have this orange-green color shift just don't do it for me! This is Chunky Holo Purple over Sally Hansen Complete Salon Manicure - Trouble Maker. The glitter is the same, so the flash is the same - mostly orange, with green only at extreme angles. Weirdest pictures ever! But that was the only angle that I could see the green that way. For some people I'm sure these are dreamy! But for me, meh. Fortunately, I only paid $1.75 for each of these on Beauty Joint. What do you think? Are these your thing? I'm glad I didn't order these! The name is really misleading! Few days ago I ordered both of them. Finally the post on the chunky holos! I commented on your kleancolor haul a while back and I was itching to see the post on these two. They're not holo at all, but they still look interesting. Is it just me that thinks they look cute alone too? I just got these in the mail two days ago. I think it looks awesome on your nails! I just god some of them too and you are right, they are not really what I thought they would be either. Thanks. I had thought about getting some of these, because they do look pretty in the bottle pictures. Glad I didn't, because I'm really not a big fan of the hex glitter. I would like some recommendations on reasonably inexpensive flakies that I could use for layering. I like a blue/purple/pink flash, rather than yellow/gold if at all possible. I think they look great on your nails too! THese disappointed me a bit. Like, if I wanted the red/orange thing, I'd just go with a flakie. I ordered ALL of them. The only other one worth having us Chunky Holo Black.... It has all different sizes of glitter and is totally awesome. I don't like these polishes either. I don't get why they're called "holo" .. don't they classify more as duo/multi-chromes? I got the fuchsia, bluebell, and black ones. I'm excited to try the black one out because it has different sizes of "holo" glitter in it.